KFC lovers are being urged not to call the police over the fried chicken “crisis”. The fast food chain closed half its 900 UK outlets after “operational issues” with its new delivery firm DHL. “For those who contacted the police about KFC being out of chicken…please STOP” officers in Manchester pleaded. Police in London joined them in tweeting the chicken shortage was “not a police matter” but neither force could confirm if it had received calls. 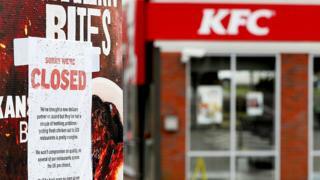 Fans of the fast food chain have been in a flap on social media using the hashtag #KFCcrisis to complain they were left feeling peckish. And complaints from “disappointed” customers have been winging their way to MP for Bermondsey & Old Southwark Neil Coyle. 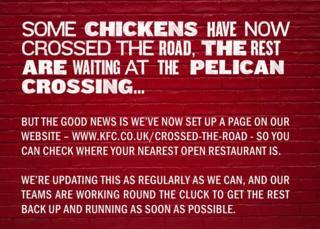 KFC tweeted that more than half its restaurants had reopened on Tuesday afternoon. But the “crisis” looks set to continue with hundreds of outlets remaining closed, while others will have a reduced menu or shortened hours. However, one half of children’s entertainers the Chuckle Brothers posted a cocky tweet after he managed to get his hands on some chicken and chips. But Paul Chuckle, 70, whose real name is Paul Elliott, had his feathers ruffled over the fact coleslaw was missing. PreviousAd execs probably should have read the full MLK speech before making that commercial.